Do you want to Catch a Demon? 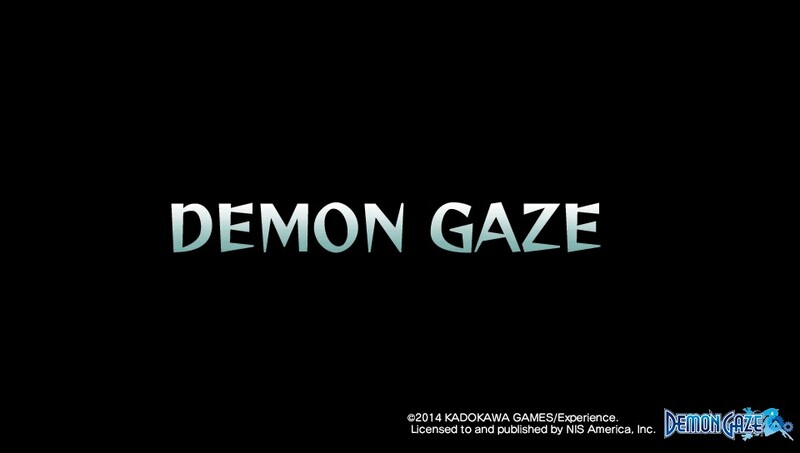 Demon Gaze The Review! | ZQuestion Reviews? ← That Review for “That Trivia Game”!!!! Have you ever had one of those days that you wake up in a dungeon.. Not knowing what the hell is going on? You slowly start to explore the grounds for a way out… and start to hear/see things that are not right. You finally get out and you are told after a few minutes that you are a “Demon Gazer”? This only happens in two places.. 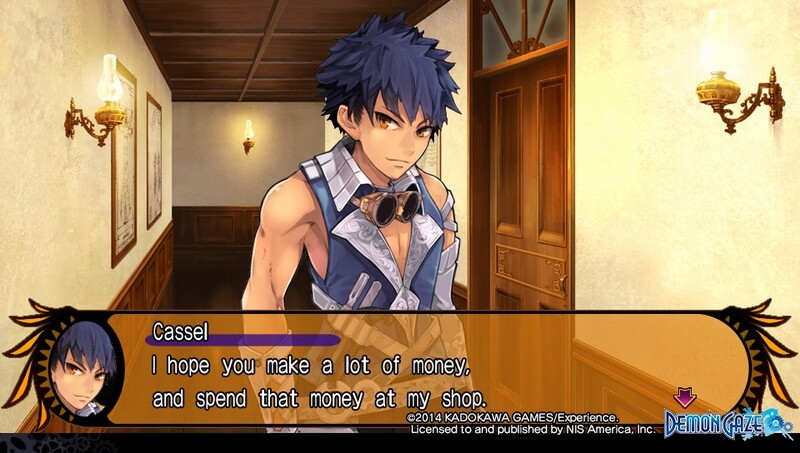 The first is in Utah.. and the other.. Well… that is what happens to you in “Demon Gaze”. Like Fran says, “You are the Demon Gazer”… A person that can capture and take control of Demons.. What do you do with these demons? Well use them to help you in battle to fight other demon monsters. Wait.. this sounds like Pokemon… But it is not Pokemon.. No This is not Pokemon.. or Beyblade.. or that game where you have little robots fight other little robots.. No.. this is Demon Gaze! 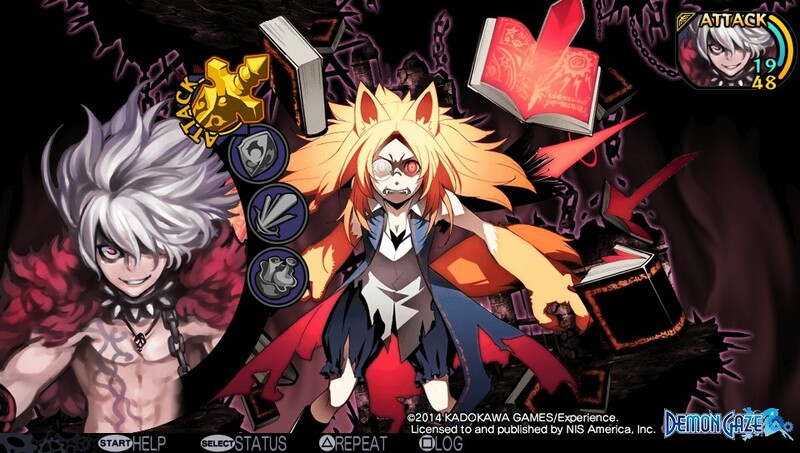 Right from the start, Demon Gaze does something pretty impressive with your character art. 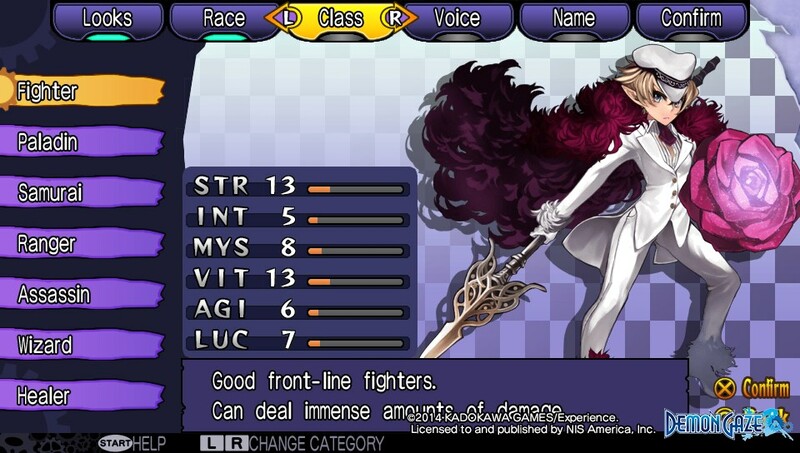 They give you a choice of 45 characters to pick from.. 50 if you have the free Disgaea Art DLC.. Yes you can play as a Prinny.. Hell yes..
After you pick what you want to look like you are then allowed to pick your Race. As the picture shows you have Human,Elf,Dwarf, Migmy and Ney. Then your off to a laundry list of Class selection. As shown, You have a choice to make and this is important to your play style.. Do you want some front line rushers? Or do you want to be in the back pulling off magic and healing people. This stuff matters you know! Well Before you know it.. You are the Demon Gazer and you have to fight your first Demon.. The Battle system is standard. You have your attack, defense, spells/magic and Items. Your first battle gives you a small hint of what is instore for you. Before you know it.. You have won! And she has become your wife now… Wait.. she isn’t your wife.. But she will help you in battles or she will kill you.. But I will explain this later on.. So you have a room that you have to pay for.. Every time you come back into the Inn.. First the rent is cheap but the more you come and go.. The more it goes up.. But don’t worry if you can not pay sometimes.. You just go into her debt.. No big deal.. But you better pay her quick and rent out another room for help. You see you can have up to 5 rooms. 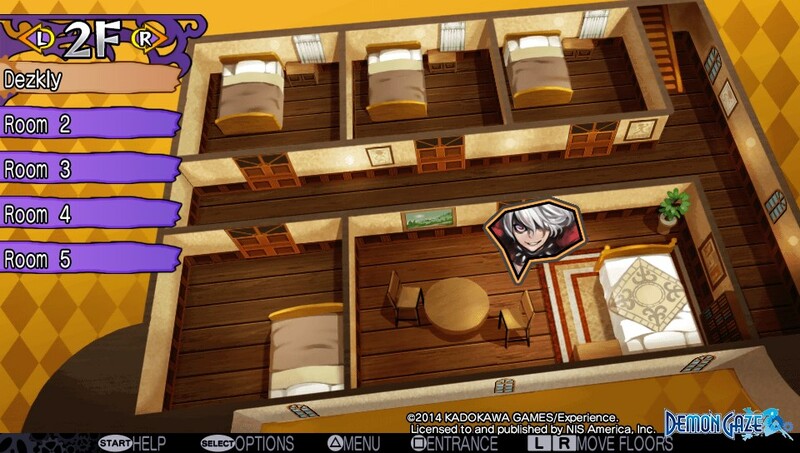 Each for a character that will go out in battle with you.. More rooms.. the more you are going to have to spend. Hell they do give you one for free though..
Yea.. He wants your money.. Everything around the Inn cost money almost.. Except the Bathroom.. You can change your character art and more for FREE! But enough of all this Inn Talk.. you want to go out and Battle.. Go forth! You travel to Red City and Lancelorna shows you the ropes of the Labyrinth. You move one square at a time in a first person view.. Now its not like 1 foot stop and fight.. No.. What I am talking about is every time you move is a square on the map. Your job is to fight random monsters and find Gem Circles.. If you find all the gem circles on the map.. Fight the monsters on them.. You can fight the main demon for that Labyrinth! You win.. You got yourself a new demon slave to control..
“You Said Random?” Yes.. Yes I did.. you can get into random battles just buy moving.. You can also get into battles by coming across floaty icons with skulls on it. Once the battle starts.. The fun begins! So you know how I brought up a bit of the battle stuff earlier.. Well I can go a little deeper now into it.. See that skull on the bottom right.. That is your area where you can call on your Demon for help. She will stay out as long as you want.. but a small catch is in place. You see that chain.. Once that hits Zero.. 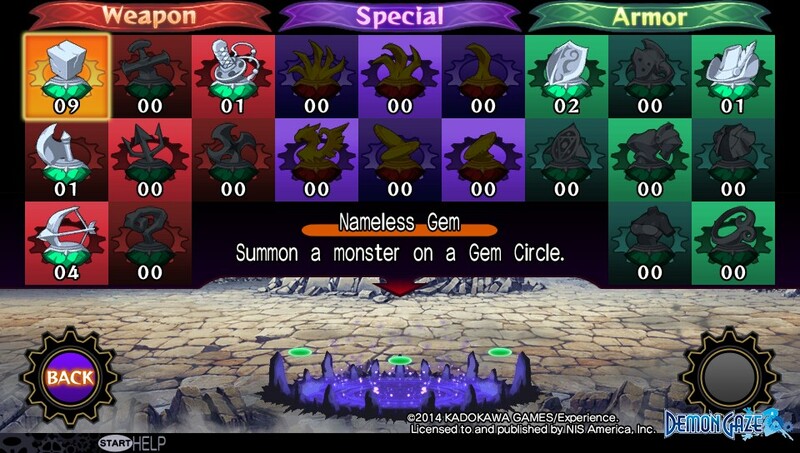 Your demon rages up and goes batshit crazy.. and she will try to kill you..
Once you find a Gem Circle, You will be introduced to this screen.. See some monsters drop gems.. Random gems.. and you can use these gems on a Gem Circle.. A Max of three! What does this do? Well depending on what gems.. If you are successful in battle.. You might get a item type of gem you used.. So if you a armor gem.. You might get some armor.. Also once you have take over you can return back to it and Save.. This is important and is really the only places outside of the Inn that you can save at. Another must use item in the Labyrinth is the memo/notes that are littered around the map.. Think of that other game with Demon In the title…. If you have chalk you can actually leave your own notes.. This becomes super useful in the game when secrets are around every corner. But this is only when your online.. So play online.. Alright..
Before you know it.. you have all the circles and it is time to get into your first real boss fight.. MARS! Two things can happen.. You will die and you will grind a bunch to beat her.. Or you will get lucky.. After this happens.. Well.. I will let you just play to find out more.. The Real Review part of the Review? 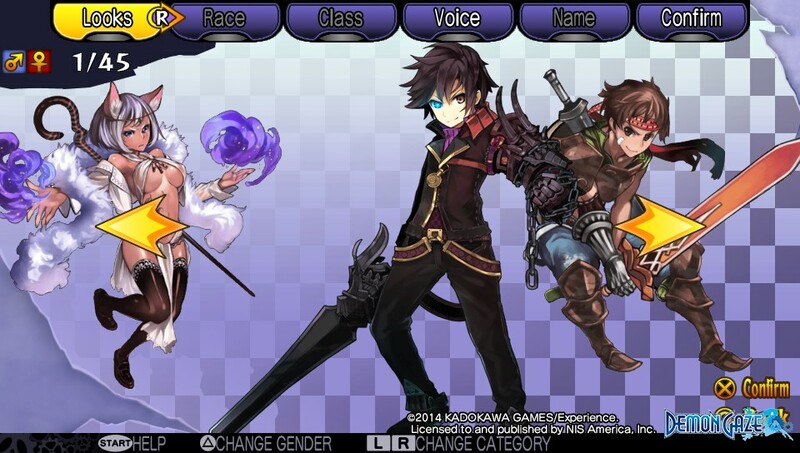 “Demon Gaze” is a throw back to old First Person Rpg’s.. A rarity in this day of age sadly. Only a few titles in the last few years have done this on consoles and most have not jumped the ocean. 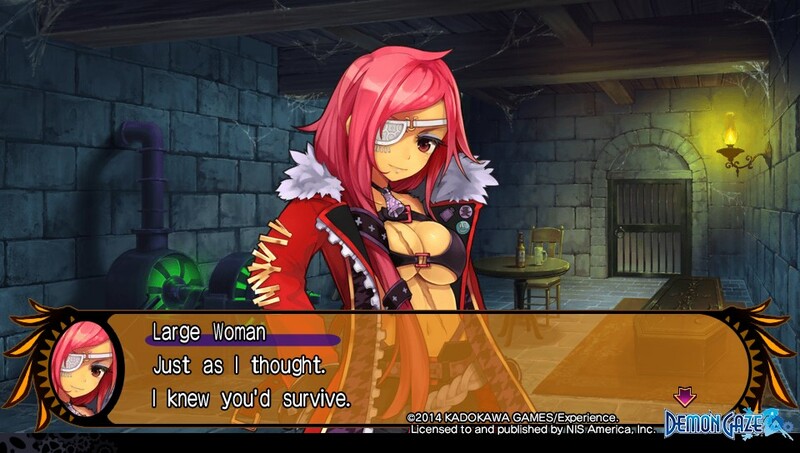 As you expect with this type of game.. Demon Gaze can be downright brutal at times. Even playing on the lowest setting.. You will have problems.. You will die. You will lose progress if you are not careful. If You and your crew dies.. You find yourself back to the main menu.. No continue.. no redo.. 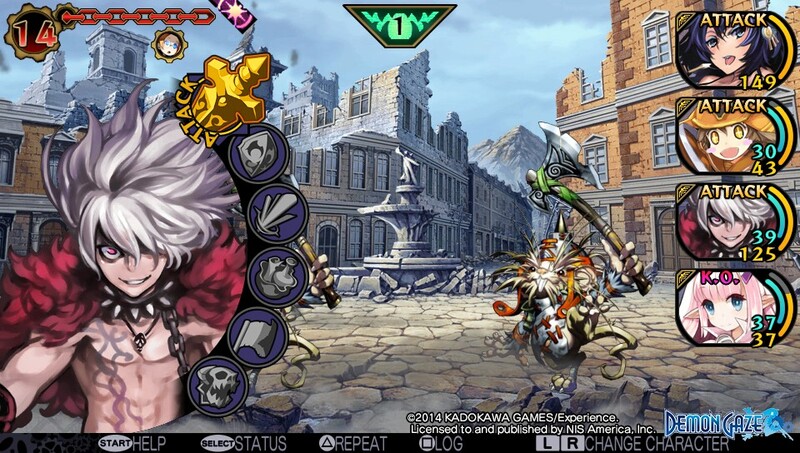 This is the world of Demon Gaze. This game will push you, It is a challenge but a fun challenge. At times you will hate it but you will find yourself wanting to continue and get better. Demon Gaze does not hold your hand.. 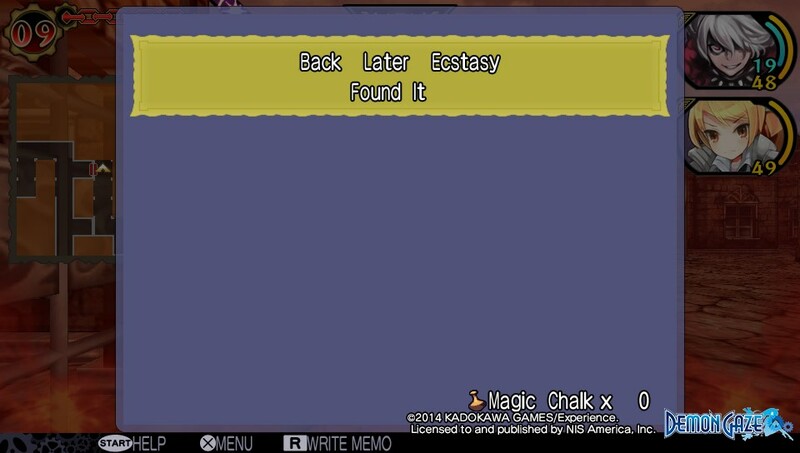 It barely tells you what you need to do.. Its more of a ” Explore and find out for yourself” type of game. Another side of this game is fan service.. Yes this game has fan service.. So if your into that.. your good to go.. If you are not.. you can always turn your head at times… maybe cough.. I don’t know. What about the length of the game? Do not expect to be done with this game quick.. This is no 8 hour game.. This is a 40-50 hour game if your lucky. To be honest this game is more of a game you pick up and put a hour or so into a day.. This way you don’t break your vita from random outburst of rage. Overall, I like it.. Like I said before the game is brutal but fun. So I give it a Approval. If you are into RPG’s.. Pick it up.. It is a throw back to the First Person Play that we just don’t see that much of anymore. 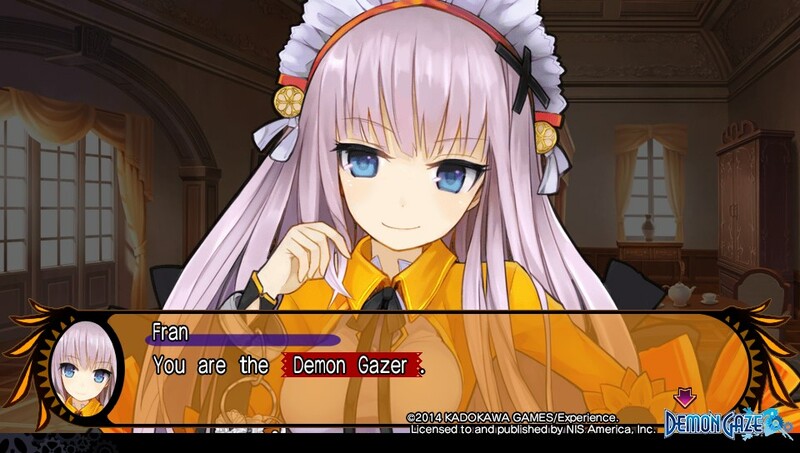 Demon Gaze is out now at Retail for $39.99 or you can get it digital from the PSN.. It is under 500mb so your good to go! *Disclaimer* The nice people at Nis America was nice enough to provide a code so I could play this nice game for you people.. I did not break my vita while playing this.. I almost did.. But I did not..
Posted on April 24, 2014, in REVIEWS! 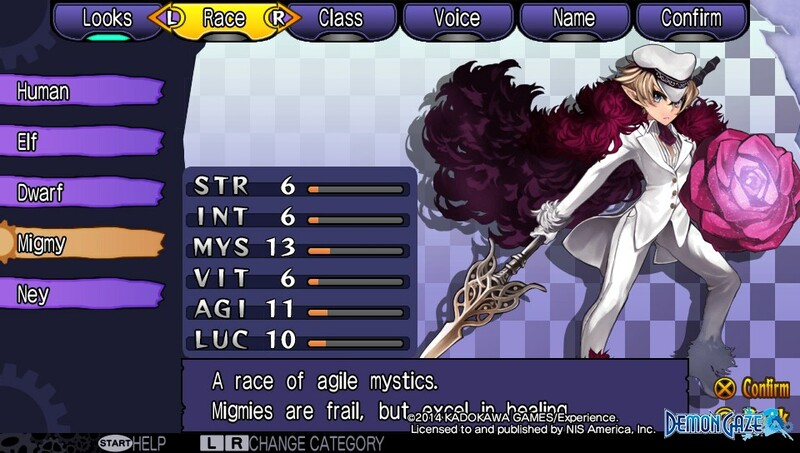 and tagged DemonGaze, NIS, NISAmerica, PlayStation, RPG, Vita. Bookmark the permalink. Leave a comment.